Placencia! The beach, the beach bars, the shops, the restaurants… we love this town. 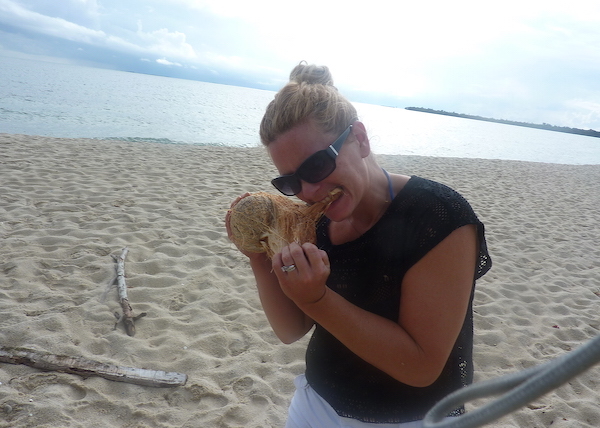 We also love coconuts and they’re abundantly available for the picking all along the beach. 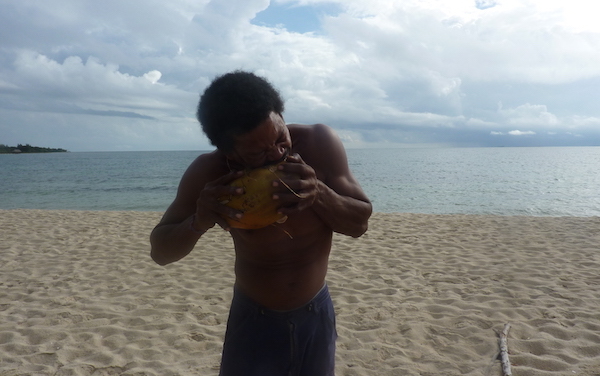 We tracked down a local guy known as The Coconut Man to get a lesson on the delicious staple. He’s easy to find; look for him on the beach in the morning harvesting coconuts and fronds or around the bars in the afternoon selling his nifty woven hats, baskets and beer koozies. 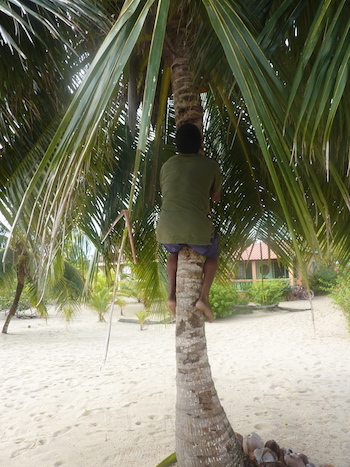 I learned how to select coconuts from the tree and how to distinguish between a young coconut and a mature one. 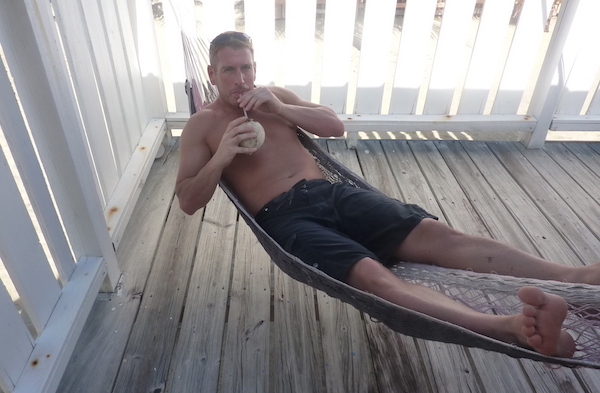 The young coconuts are great for drinking and surprisingly sweet and carbonated. It’s like drinking a sparkling water with an earthy sweet taste- very refreshing. A young coconut wouldn’t have much flesh inside and the texture of what little meat there was would be slimy; not very flavorful either. However this slimy flesh is high in nutrients like iron and zinc. 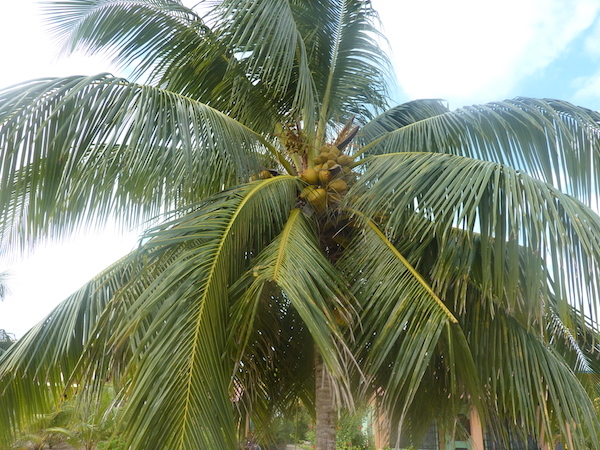 A mature coconut is going to have less water in it but more meat, and the flesh is going to be more dense and hardened. It’s pretty high in fat (the good kind though) and fiber so I don’t imagine you’d want to go really crazy with consuming huge quantities of it. My internet research tells me you can make coconut milk and coconut oil from the mature meat; I’ll be trying this when we’ve made our move- you’d better Belize it! 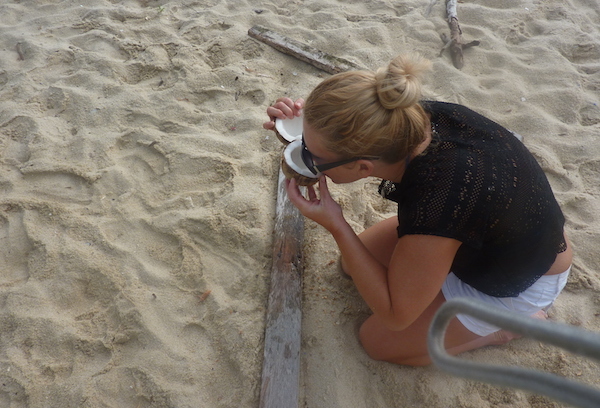 The Coconut Man showed us how to open the coconut we harvested right on the beach without any tools. 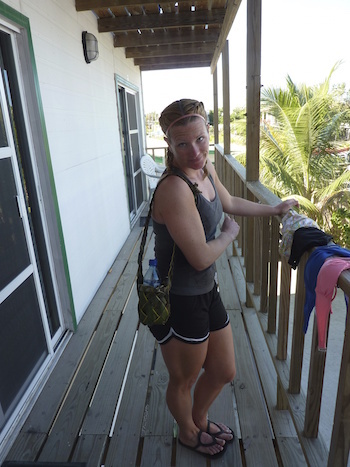 This is a survivalist skill I’m glad to now have but I have to say that one of the first purchases I’d make in Belize is a machete because using your bare hands is pretty tough work. At the end of our “lesson” the Coconut Man gave us a beer koozie he’d just woven while talking to us- how cool! we were supposed to put it in the freezer for half a day to season it so it would last indefinitely but the mini fridge in the cabina was insufficient and I had to trash it a week later because it started getting a little gamey. 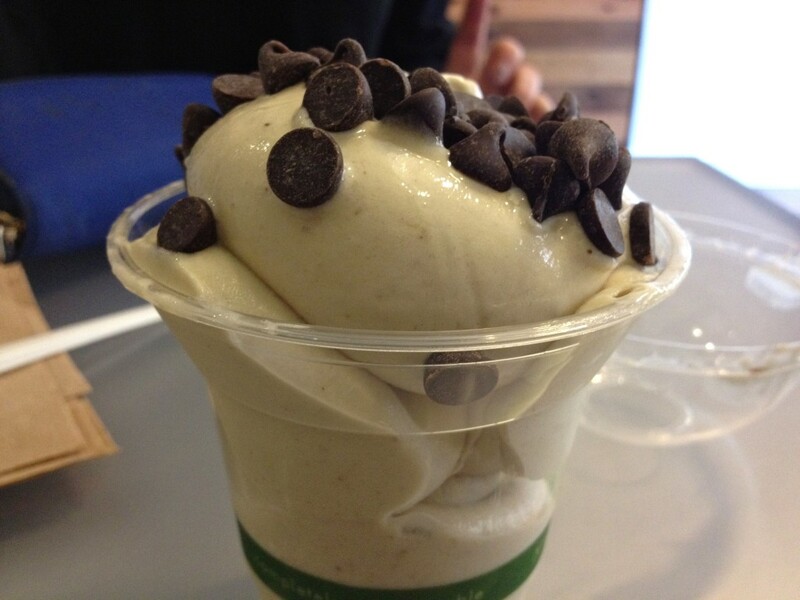 Coconuts aren’t the only delicious things that grow on trees around here. Just a quick drive up the peninsula to the mainland and you’ll see citrus and banana farms. We drove through one on a horseback riding/ waterfall tour we took one day. Belizean oranges don’t look like the big California oranges we get here in the states but they’re sweeter and used almost exclusively for juicing. Bananas grow the opposite way I’d think they would and all the trees in the orchard had blue bags over their fruit. I don’t know what the bags were for, maybe preventing bugs or bats from eating the crop? 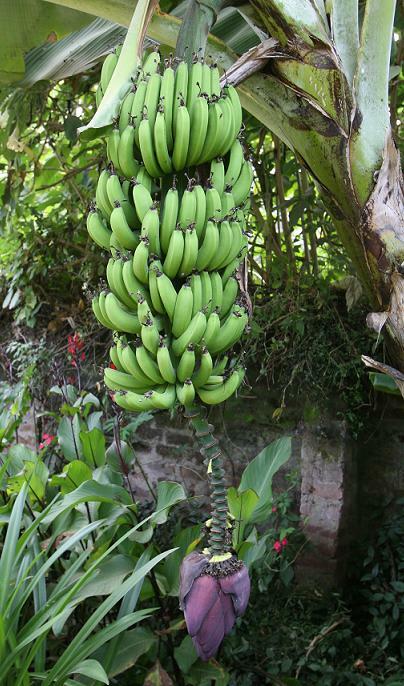 I’d like to have a banana tree in my backyard. Business idea: I could sell banana whips! We have a place on the Ocean City boardwalk that makes these- it’s frozen bananas run through a food processor so it comes out like soft serve ice-cream but it’s just fruit. They have a bunch of healthy topping options to jazz up your whip. I’m thinking a Belizean banana whip would have some shredded coconut on top with maybe a drizzle of condensed sweetened milk and chocolate syrup.